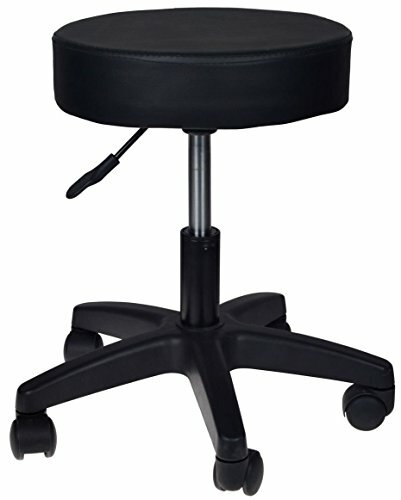 Condition: Brand New Color: Black Material: PVC Leather and Aluminum and Plastic Base This salon stool is made of high quality PVC leather and 3 1/4'' thick foam cushioning seat for maximum comfort. It is widely used in hairdressers, beauticians, barbers, dentists, tattoo makers. Hydraulic design is convenient to adjust the height for better suitable position. Plastic Base, 250lbs Capacity. 360 Degree Pivoting Seat. Durable PVC Leather best for Salon Using. High density sponge, not produce distortion. 3 1/4''Thick Foam. Large 14'' Diameter Round Seat Surface. Hydraulic Height from 16 1/2'' to 20 1/4''. 20'' Diameter base Dimension. 8 1/2'' L 5-leg Base.